Are you a single parent? Travelling with a blended family? Are you familiar with the essentials of what you need prior to traveling? Surprisingly, fewer people than you’d think are actually in the know with the things you need to present to a customs agent if only one parent is traveling with a child. Concerns about child abductions have made governments around the globe very cautious when only one parent is traveling internationally with a child who is a minor (under the age of 16). Child abduction is an increasing occurrence, and customs and border agents have been trained to be on the constant lookout with anything even remotely suggesting that only one parent is aware that a child is travelling. 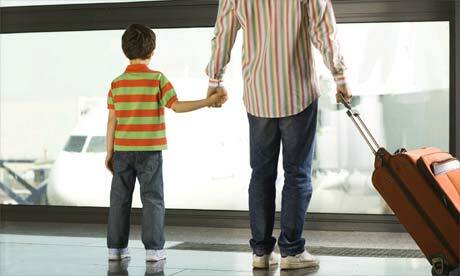 Here are some tips for important items to include if you are traveling without your child’s other biological parent. Besides your passports, you should bring a written consent from your child’s other biological parent. Indicate the flight number on the consent form so there is a clear acknowledgment of where you are going, as well as when and how you are coming back. The consent form must indicate your name and contact information. You are required to have the consent form witnessed and notarized by a lawyer. You will need your child’s birth certificate. These required basics are in essence permission from the other parent. If you’re without them, your travel can be compromised. We’d love to hear your thoughts or experiences with respect to traveling solo with your child. Share or leave a comment! What do I do if I have full custody of my child and have not contact with my ex-husband and have not for 10 years. Any answer to Barbara Roy’s question above? I am in the same situation, have full custody and my ex has no access, what do we do in this case? (FYI he also refused to sign the birth certificate, so he isn’t listed there with the gov. either). Any input? No answers to the last two answers above? I have a friend as well in the same situation who is a single father with the only custodial and guardianship rights to his child. The mother relinquished all custodial responsibilities shortly after the child was born and she “disappeared” so he is literally a ‘single’ parent by name. He is not even married, divorced, or widowed, so the only documents he has of her is a legal document indicating her relinquishment to all custodial rights of the child. There is absolutely no way to get a consent form from this person that cut off all ties and “disappeared.” Could my friend possibly use that custodial relinquishment document I mentioned above with official translation approval and notarization instead of the consent form? Hello, I am not sure, but it sounds logical to try. Why you don?t send a written question to passport Canada and see their reaction. This situation is no more complex than a single parent. Thanks for your post. I know this is an old thread above, but hoping I can help others in this situation. I was in court recently where a parent wanting to travel was in the same situation. She brought a Motion (which costs nothing in Ontario), along with filing whatever documentation she had showing the other parent has no contact with the child. She did attempt to “serve” the other parent at their address or place of employment. The judge did a document up for the parent to take to the passport office. It was a very quick process, all of about 5 minutes of explaining her case. Now she is able to obtain a passport for her child. This is probably a fairly common situation which the courts are able to help out with. I would like to know what happens if the child birth certificate has only one signature on it. How to proceed if we need to travel? Hi Nishi. Thanks for your question. We’re not sure what you mean by one signature. There is no signature on the birth certificate. Some birth certificates just have the mother’s name. In this case, the father’s information isn’t requested for the passport. I got a passport for my daughter a few years ago no problem. Her father has never been in her life and I never put anyone on her birth certificate. Just get the big version of your child’s Birth Certificate wherein it should list the parents. THis way they can see that no one is listed under father and it shows you are the only parent. I also had someone who has known me for over 10 years write a letter saying that no father figure to their knowledge has ever been in the child’s life. Get a few people to write these letters. Every little bit helps them decide if you should be able to get a passport for your child. My family is planning a trip and want me to come. I haven’t gotten my childs passport. He doesn’t have a father in his life unfortunately and there is no name stated for a father on his birth certificate. Will I have to do anything special to aquire a pass port for my child?